This building is part of the Montana range, and it measures 4 m wide and 3 m deep. This makes it the most compact of the range. 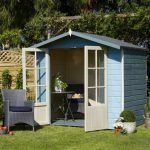 The structure has been fitted with 28mm cladding as standard, and this supplies the exterior with a tough feel that should manage all weather conditions. The Montana I also has an 11mm tongue and groove roof, which adds extra stability. It is also strong enough to take the shingles roof covering option that the company offers as an extra. There is a mineral felt option for the roof covering as well. There are two flooring options of tongue and groove, at 11mm and 19mm. The building is not supplied with a floor. The glazing in the building is single but you can purchase double glazing from BillyOh. The Montana I also comes untreated, with a range of treatment options available from the manufacturer. The single glazing may not be the best solution, and certainly won’t provide year round warmth. The double glazing option is quite essential. 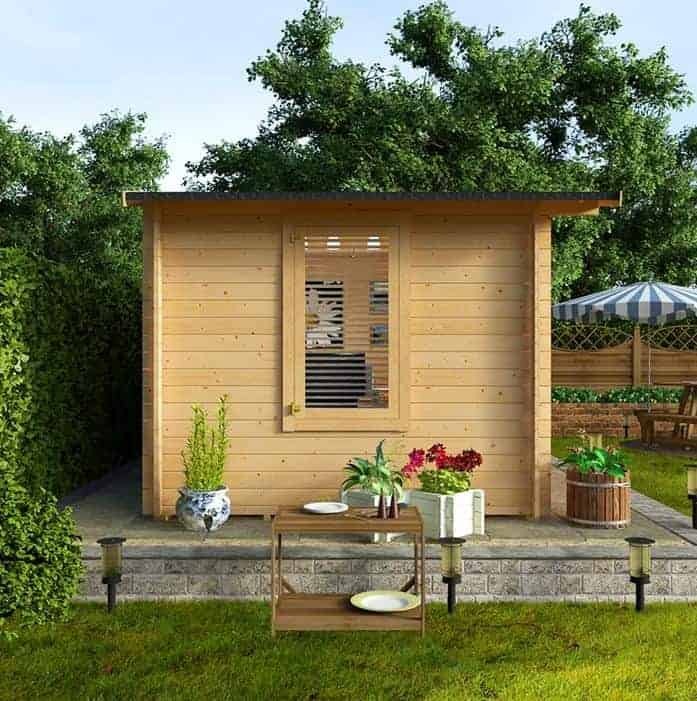 The Montana range is one we like, and we think it’s all down to that great ‘log cabin’ feel the buildings have. We can imagine this building being found in a mountainous area in the Rockies, for example. It looks good, robust and rugged, the kind of place you can spend all year in as a hideaway from the stresses of life. So how does it measure up? Well, this is the smallest of the three in the range, with a depth of 3 m. The depth is the only thing that differentiates the three buildings, because they are all 4 m wide. So this is the one that has the least depth to it. Step inside and it doesn’t make a difference as far as we’re concerned. There is plenty of room here and you can easily fit the building out as a good size home office. If you’re using it as an extra lounge, there is enough space here for a sofa and chairs, as well as a table. The depth didn’t really bother us, but if you’ve seen the other Montana buildings on this site you will know that they get deeper by a metre every time. So if you need more depth, you can choose the 4 m Montana or the 5 m Montana. It’s all dependent on what you intend to use the building for. Some people want a larger home office, for example. To put all of this in perspective, if you were to buy a standard office desk for the building, it would be about 1200 cm in width. So that should give you an idea of what it would be like to fit a home office set up. Plenty of space, in other words. 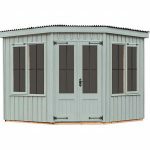 Like the other Montana buildings in the range, this one has 28 mm thick cladding fitted as standard. There is no other option here, but this is a good thickness, and will keep a strong level of protection and strength throughout the year. It’s a good looking, tough method of locking timber together, and we have found the Montana range to be enhanced by this insistence on having 28 mm cladding in each one. Thick and sturdy, it gives the building a reliable, reassuring solidity. 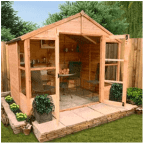 Just like the other Montana buildings, an 11mm tongue and groove roof is supplied as standard. We can’t really fault this decision by BillyOh because it outclasses plywood sheet for starters, and it’s a good thick and heavy roof that should be able to withstand anything. This roof also allows you a little extra in customisation too because it’s tough enough to manage roof shingles. These are heavy, and need that tongue and groove base beneath them. To put it simply, tongue and groove will stay solid and locked together in all weathers. Be aware though that this roof comes literally as a timber roof without any covering on it. The shingles are our choice here, because they provide enhanced durability and UV protection too. This allows them to keep their wonderful colour for years. Some shingles don’t have UV protection and can fade, but not these, and there are five vibrant, exciting colours to choose from. You can also choose the mineral felt roof option. This is easy to fit and provides even better protection against rain than the standard sand felt that is found on many outdoor buildings. For us, shingles are the way forward. They really finish off the building and give it a smooth, modern appeal. 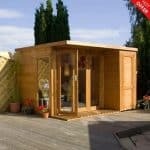 We also genuinely believe that a building of this quality deserves that finishing touch. But of course, that’s just the WhatShed? opinion. The building is not supplied with a floor. BillyOh have kept the same deal with all the Montana models and supplied bearers only. This allows customers to get creative if they want to, but we certainly do not recommend fitting a plywood sheet floor. This building, even with seasonal use, deserves a good, solid tongue and groove floor that can take the weight of heavy furniture and the heavy year-round footfall we’re sure it’s going to receive. You can certainly choose the 11mm and feel assured that it will handle that year-round traffic, but there is a 19mm tongue and groove option for extra toughness. 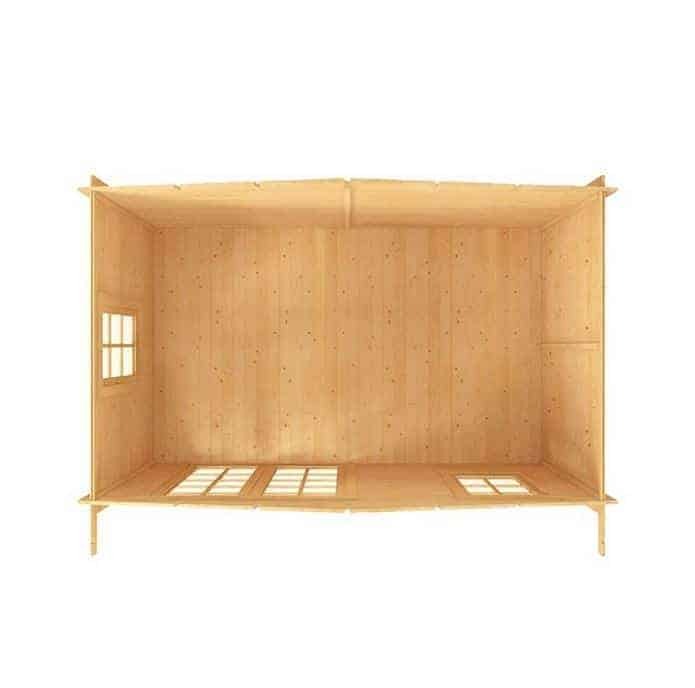 To be honest, for a building this size, and even if you’re using it for everything (apart from a gym), the 11mm tongue and groove will be perfectly fine. This is the Montana that has just the one window. It’s large, and runs almost the height of the wall it sits in, but if you wanted two windows down the side of the building you will have to upgrade to a Montana II or III. The window is single glazed, which means it’s toughened plastic. This won’t bring you any insulation in the cold, so BillyOh are basically saying ‘use this for the summer or invest in our double glazing’. If you’re putting down tongue and groove flooring though, we’re guessing you’re thinking of a cosy investment, for year-round use. In that case, get the double glazing. 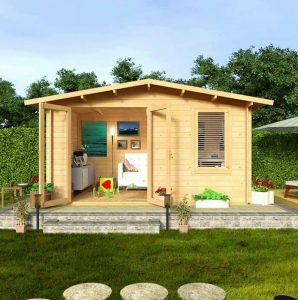 It’s a sensible upgrade, even at the price BillyOh sets, and will give you insulation and soundproofing in the middle of winter. BillyOh supply Montanas in the original, unfinished state, so you either get down to the DIY store and buy some finish or you order direct from the company. BillyOh do offer four excellent standard finishes that offer protection against mould and erosion, as well as 9 lovely premium paints. There is also a varnish tin available. We recommend buying from them, and treating the building immediately, and then annually. The tongue and groove element assures you of quality throughout. If you’re looking for a well-built product, this is a good example. Assuming you treat it, this is a good building that should provide you with years of enjoyment. Some people may want a little more space, but this is still benefitting from 4m in width, which is ample for entertaining for example. It is easy to put together, and should be done within a couple of days with a couple of people. You do get a lot with this building, and we agree that there is more to come if you customise. But as summer building there is plenty of value here. 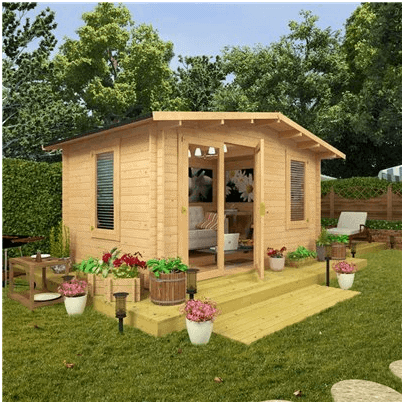 Final Thoughts: An excellent building that, while being the most compact in the range, is still roomy enough for some entertaining and even a small office. It will need a little extra customisation if you are to make the most of it, but we feel this is justifiable at such a sensible price point. 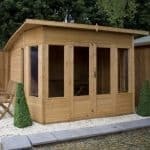 The single glazing will always be a sticking point with us because we believe garden buildings should, in the main, be all year around structures. But purchasing double glazing is possible, and this will soon sort out the issue. 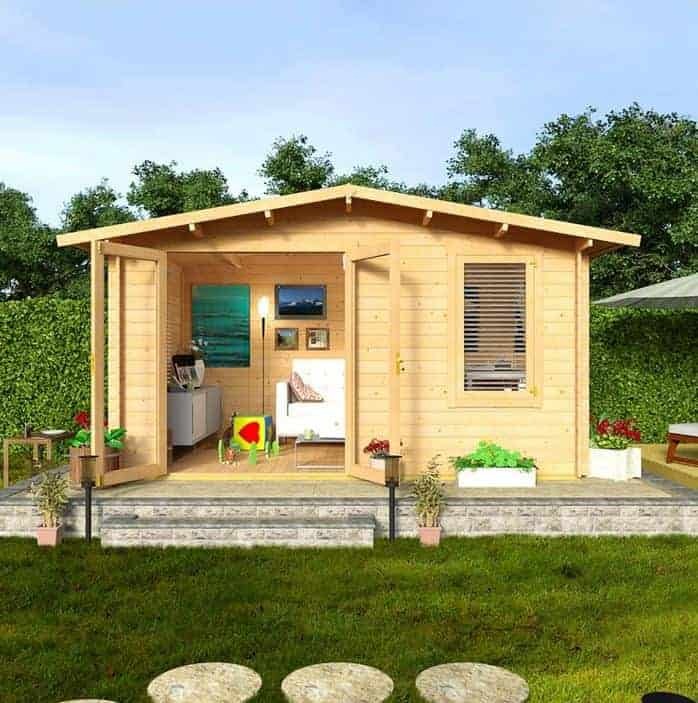 We like the overall build structure, and in particular the 11mm roof, which really brings some solidity to the cabin. 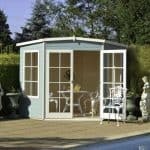 This is a great little building, that can be enhanced further through customisation.